Despite its jokey name, lifted from a Bonzo Dog Band song title, Death Cab for Cutie have been releasing intriguing, largely wistful albums for 20 years now. Their latest, Thank You For Today, its ninth, continues the traditions of complex, brainy lyrics often reflecting loss and heartache, in catchy little melodies. The band’s big show at the Anthem in Washington, D.C., began like the album, with the neo-electro approach of “I Dreamt We Spoke Again,” a haunting vision wrapped in a precision dancefloor sound. As the first tour and album following the departure of guitarist Chris Walla, you might think they’d all gone to keyboards considering the single guitar approach. But Dave Depper and Zac Ray switch back and forth between keyboards and guitars, as the songs require. Death Cab is all still entirely the showcase for Ben Gibbard, the singer and songwriter who began the band as a solo project. The songs and show swirl around his singular vocals and the kind of word arrangement that not only stick in the minds of fans, but cause them to shout them out. 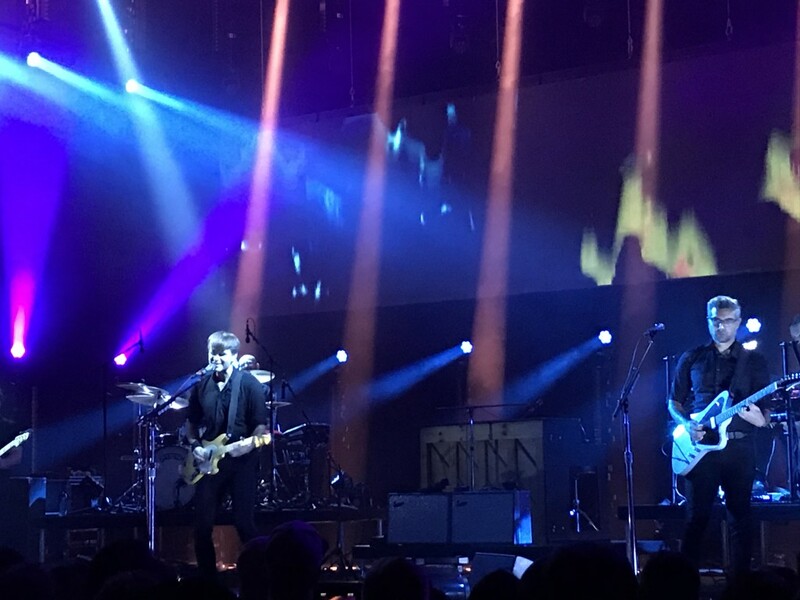 Gibbard, like his band mates, switched between instruments as well, from the guitar on most songs, to an upright piano situated at the rear of the stage, to songs like “60 & Punk,” in which he berates an unnamed former hero for current drunken behavior, which he just sang into a microphone. The lone clean shaven musician amongst a band of beards, Gibbard was further highlighted by an arresting lighting design, that had eight strips of versatile lights behind them and five on each side, creating a box of mood setting illumination as well as a wide video strip of constantly moving abstraction, like early Ed Paschke paintings brought to life. The breakup songs came heavily and frequently, but the death songs still held the most weight, from the hospital scene in “What Sarah Said” to the stark pledge of “I Will Follow You Into the Dark,” which he saved for a solo performance to start the encores. Both of those songs came from the 2004 Plans, the band’s one platinum album that still holds up quite well and was otherwise represented by “Crooked Teeth” and “Soul Meets Body.” But other than the seven songs from the new album, the most represented work in their catalog was the 2003 pre-major label Trasatlanticism, whose tracks still tended to be the cappers, both in the regular set with “The Sound of Settling” and in the encore, with the building grandeur of the title song. Gibbard said he was happy to be in “the birthplace of American independent music,” though it was unclear whether he was talking about the indie heyday of Dischord or the nation’s capital in general. He also said D.C. was the best show on the tour, which may have been one of those singers say about every show. But there was a surprise in the performance as Chvrches lead singer Lauren Eve Mayberry, who was recruited to sing “Northern Lights” on the new album, hopped out to do the same live in D.C. — something that didn’t happen on adjoining tour dates. It was quite a lot to ask a quite successful singer on her own to come out and do (especially as she doesn’t even provide a lead vocal, but more a harmony second voice). It made one wish Chvrches were enlisted to open the show as well. As it was, the task fell to the New York rockers Charly Bliss. It was a female led quartet led by the equally high-pitched and high-energy Eva Hendricks working out of some kind of past inspiration of power pop. The modest opening set had its own challenges — band guitarist Spencer Fox had to abruptly leave the tour for undisclosed reasons, so bassist Dan Shure moved over to guitar while their music video director Andrew Costa took over bass (Sam Hendricks stayed on drums). It didn’t seem to alter the music that much but it did raise the question: Are these instruments that easy to switch off and pick up?